This Allure Beauty Box vs Macy’s Beauty Box vs Look Fantastic series compares the subscriptions every month to give you a good idea what you can expect from these popular beauty subscription boxes. Allure Beauty Box and Macy’s Beauty Box are $15 a month, Look Fantastic is $16 if you pick an annual subscription (you don’t have to pay the full cost up front), so it seems fair to stack them up against each other). 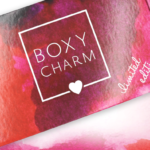 If you are interested in finding other great beauty boxes, check out our Birchbox vs Ipsy vs Sephora Play series and our Boxycharm vs Glossybox vs BeautyFix series! Check out our Allure Beauty Box Spoilers and our Allure Beauty Box Reviews, too! Check out our Macy’s Beauty Box Spoilers and our Macy’s Beauty Box Reviews, too! I love this ingredient-conscious (and pricey) brand and this mask was new to me – so it was easily my favorite in the box! This mud mask is designed to help clear out pores and firm skin. It dries in under 10 minutes, and it has a very gentle exfoliation when you rinse it off. Check out our Look Fantastic Spoilers and our Look Fantastic Reviews, too! Verdict: Allure Beauty Box was the winner for me this month. All products were great sizes, the brands are great, and it really felt like such a glam box thanks to the lashes and red lipstick! Macy’s Beauty Box: This is a brand new subscription, so we’ll have to see if things change in future months. For now, this seems to be a good box for a beauty subscription newbie. 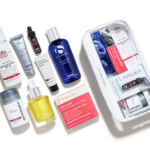 Everything included in this first box is a great beauty staple. Look Fantastic: If you’re looking to try out brands you might not see at Sephora, this is a great box to sample. (It’s from the UK.) And the UK version of Elle magazine is a nice bonus, too! Great article, Liz! I think it would be great if you and some of the other beauty girls did an article with your absolute ride or die products you’ve discovered through these boxes. As this is your job and you see so many different brands and formulas, I think it would be awesome to know which ones have really stood out and that you purchase time and time again. I mean, isn’t that why we are all subscribing to these boxes? To sample products to see if they’re worth the full price! I’d really love to see something like that in the future! I would love to see something like that too! After trying so many products the reviewers must have “all time favorites”. Maybe reviewers with different skin types and hair types. Macy’s is always the winner for me because of the gift card – whether it be $5 or $10. I must say that I’ve been really impressed with some of the Allure boxes lately. Macys also had a $10 coupon this month which I loved! Michele, i loved the $10 coupon as well. I bought meyself a mac lipstick that was on sale and only had to pay $1.19 in the difference. I cant wait until i use my sephora card for insider points it will be my reason to purchase the anastasia brow pomade and gdt points online, since my local sephora is 27 miles away in San Francisco. I think im going to try the lookfantastic box next month. It has everything that i like.